Orange Bloom - Textured Impressionist Palette Knife Oil Painting Mona Edulesco by Mona Edulesco - 8.000" x 8.000"
Orange Bloom - Textured Impressionist Palette Knife Oil Painting Mona Edulesco art print by Mona Edulesco. Our prints are produced on acid-free papers using archival inks to guarantee that they last a lifetime without fading or loss of color. All art prints include a 1" white border around the image to allow for future framing and matting, if desired. FAINTING with delight!! I love this work! Thank you. Great use of color Mona! That orange blue compliment is awesome. LF!! Fantastic painting, lovely and vibrant colours, well done! Many thanks for the Feature, John! Thank you so much for the Feature, Lori! Thank you so much Helena!! Thank you a lot Dusan! Ambitious Oranges Wonderful Textures of Light The Linear contrasting the Organic of the Floral! You always outdo yourself Mona! Thank you so much, Brian, for your Beautiful comment! Vibrantly eye-catching textured work with presence, Mona. Gorgeous colors and texture, FL Congrats! 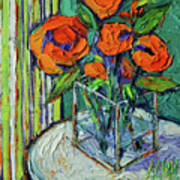 I love the blazing color and the great energy, Mona, as in all your paintings! A feast for the soul! Chava, thank you very much! What a nice compliment, Robert. Thanks so much! Also thank you very much for the feature! I am glad you like it, thank you for your beautiful comment Lori. 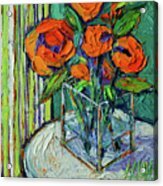 "Orange Bloom" is an original textural impasto palette knife oil painting on deep edge canvas 20x20x4 cm (8x8x1.5 inches). 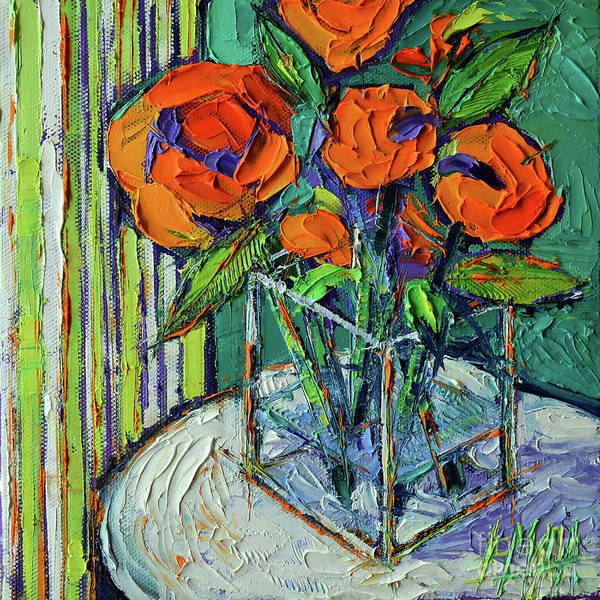 This stylized floral painting was realized in the impasto technique, with heavy textures of oil paint and cold wax medium, applied with a diversity of palette knives. Original available. Signed on the front, accompanied by a signed Certificate of Authenticity.